We arrived in Banff in the middle of the afternoon after catching a Greyhound bus from Calgary. The scenery started to change as we drove along the road, mountains started to loom in the distance and we were getting pretty excited about what Banff had to offer. 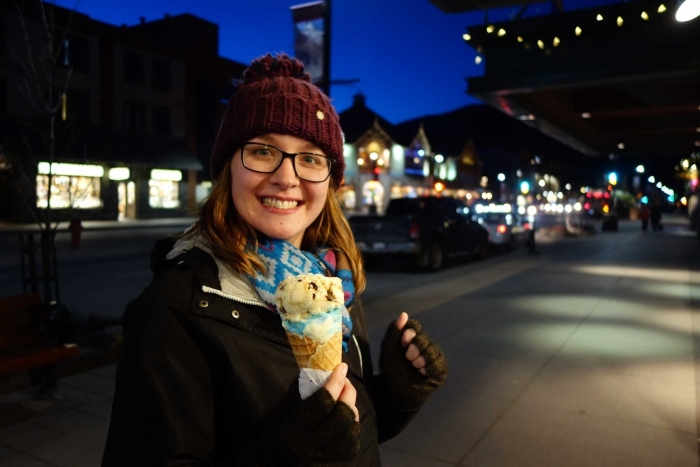 Most people staying in Banff are there for the skiing or snowboarding but unfortunately our insurance couldn't be upgraded for just a week to allow winter sports so we will just have to give skiing a go on our next holiday! We instead decided to opt for the beautiful walks in the area, staying with those accessible from town and then when we picked up our car, venturing further afield. One thing to note if you are walking in the park, check the trail details on the Parks Canada website to make sure they are open and if you need any equipment for them such as cleats. 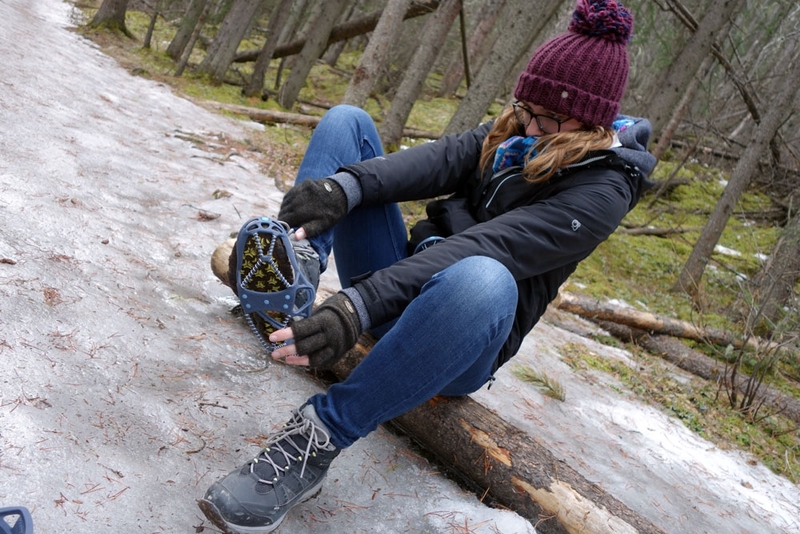 Several of our desired walks recommended having cleats due to 'icy sections' so it worked out cheaper for us to buy a pair each rather than renting them every day. I must say they were incredible, on two occasions the entire trail was just ice and although we did pass people attempting them without cleats, I must say I would not have wanted to be them! 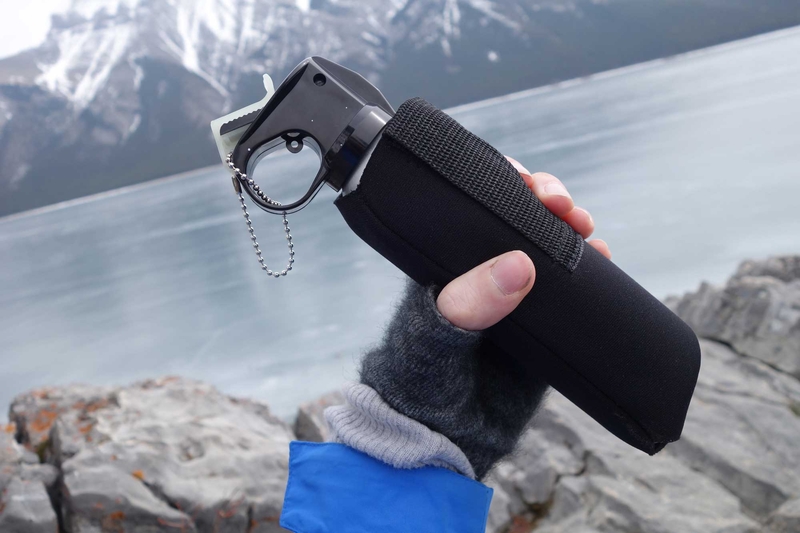 We managed to get ours from the Atmosphere shop in town, nowhere else seemed to stock them but that would be my number one tip for going in winter. 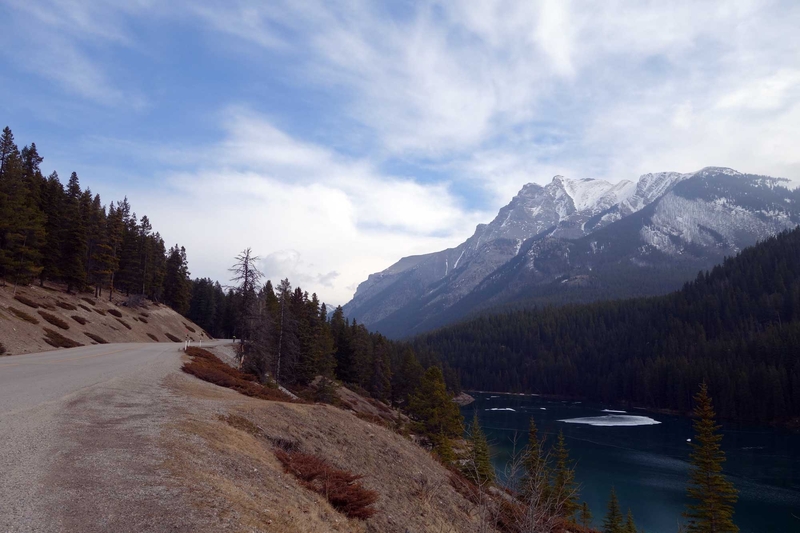 The other thing to say is that if you are driving in the park you will need to get a national park pass, either daily ones or if there for a week or more it may be economical to get the discovery pass which allows you into all the national parks in Canada for a year. This is what we ended up getting, we bought it from the information centre in Banff before picking up our car. Instead of going through our week day by day, I'm just going to chat about the walks and other things we did separately. This is the easiest walk we did I would say, you can start the trail from the town centre and it follows the river down until you reach the falls. The river was partially frozen when we did this walk but the trail was absolutely fine with no elevation at all. The path up to the viewpoint was closed however so we ended up trying to circumvent it on the road to reach the falls themselves. 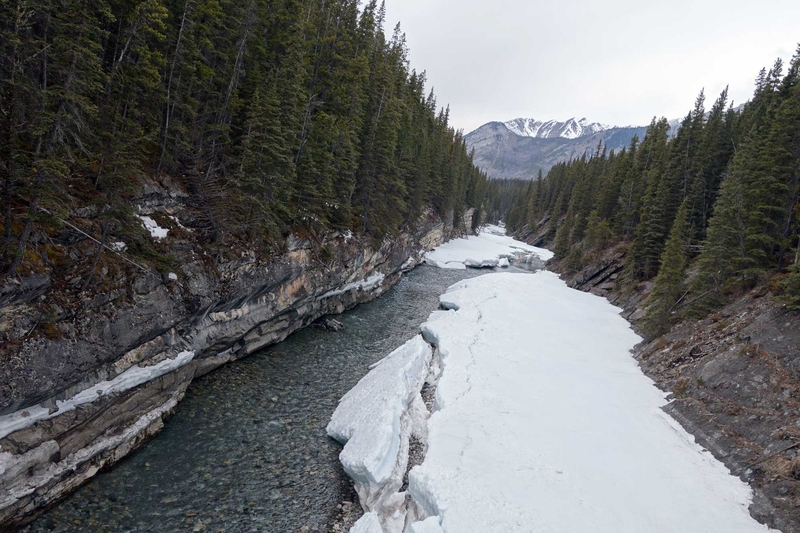 These were frozen, as was the river at the base of them which made for great photos and our first experience of standing on frozen water in Canada! 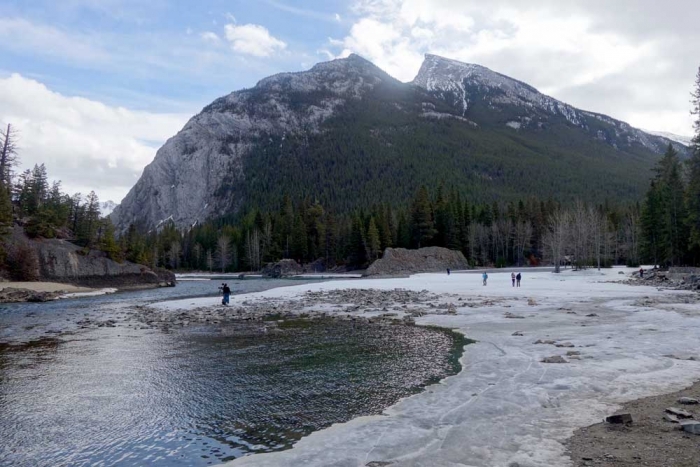 This small mountain overlooks the town of Banff itself and is another trail that can be accessed from the centre although there is a car park at the base of it as well. 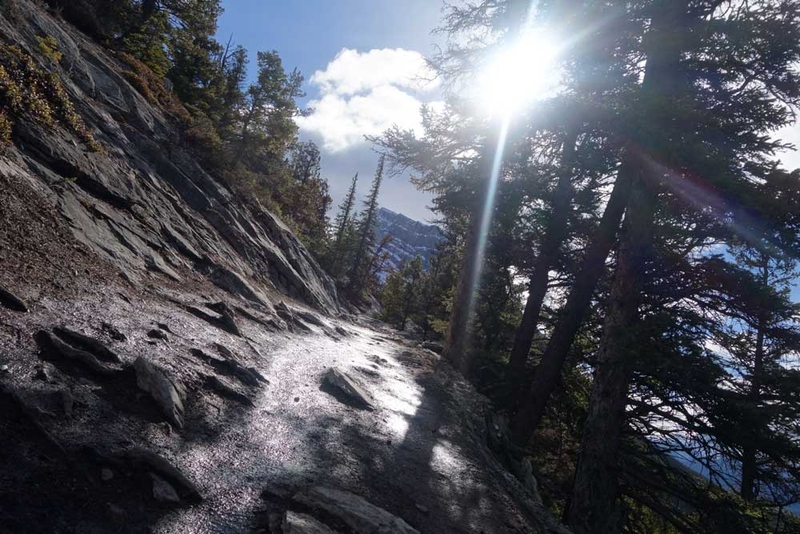 This one does involve some steep sections but these aren't as bad as some of the other hikes in the area and the trail is about 2.8km one way. There was very little ice or snow so we didn't need cleats for it and the views from the top were brilliant. I'm glad we did this one first and worked up to the higher walks with better scenery however as I think if we had done this walk later we may have been disappointed. This is one of the historic sites in Banff, where the original hot springs were found and what started the development of the national parks. We walked to it from town as we didn't have our car at this point. It did take about 30 minutes to get there just walking along the road so I would perhaps wait until I had a car if we were to do it again. 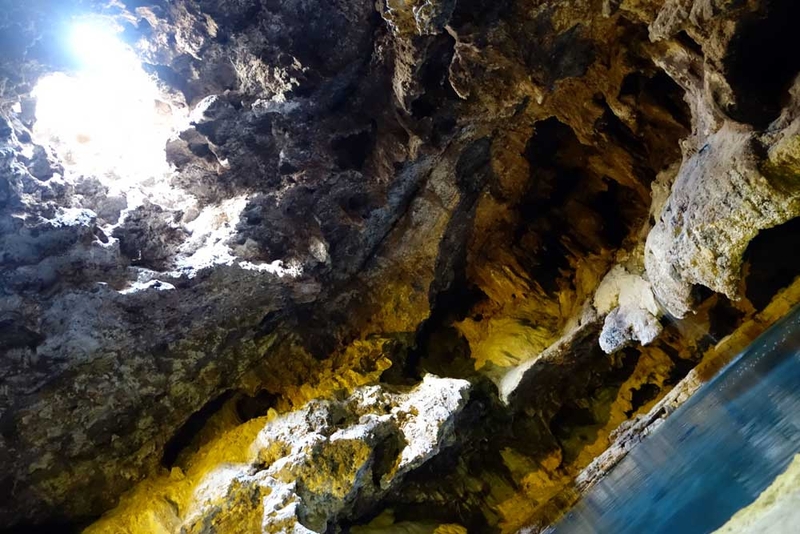 You can go into the cave where the spring was first found, do a couple of trails around the area and then sometimes have activities in the 'pool deck' which was some form of curling when we were there. I would say that we were pretty underwhelmed by it but I think we were spoilt by all the hot springs and sulphurous activity in New Zealand. We got in free because we had the discovery pass but I probably wouldn't have paid for it knowing what it is like now. Once we got our car we decided to venture slightly further afield. I must say it was an adventure driving on the other side of the road but we are slowly getting used to it, despite the odd hiccup! 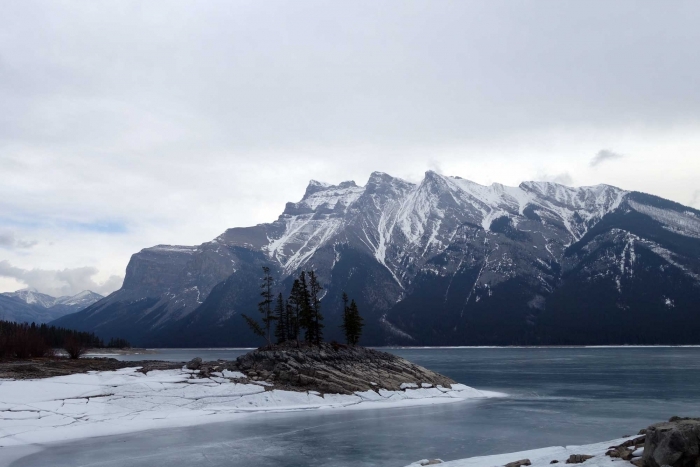 The first place we visited was Lake Minnewanka, about 20 minutes away from Banff. 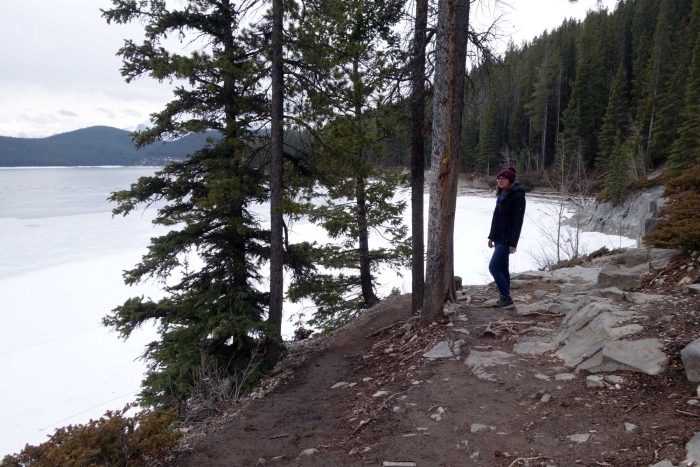 This lake was completely frozen when we arrived which was spectacular. We spent a long time gingerly walking on parts of it until the novelty wore off a bit and then we decided to start by doing the trail to Stewart Canyon. This was a relatively flat walk around the lake which took about 20 minutes or so and had some pretty views along the way. 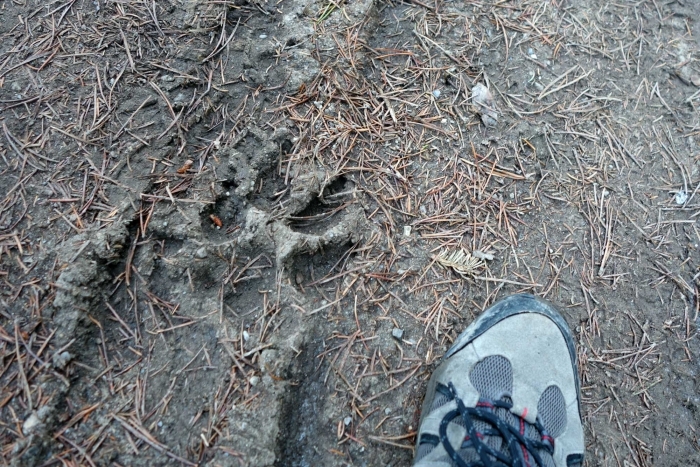 Once we got to the canyon we decided to venture on a bit but got very freaked out by all of the bear warning signs. Our accommodation had told us there was a big family of Grizzlies in this area too and had actually given us bear spray in case we needed it so this did not help our anxiety (probably mine more than Alistair's). Just to mention we stopped at a little outcropping for lunch which was very pretty, it gave a complete view over the lake and was relatively easy to walk out too so I would highly recommend it as a picnic spot. 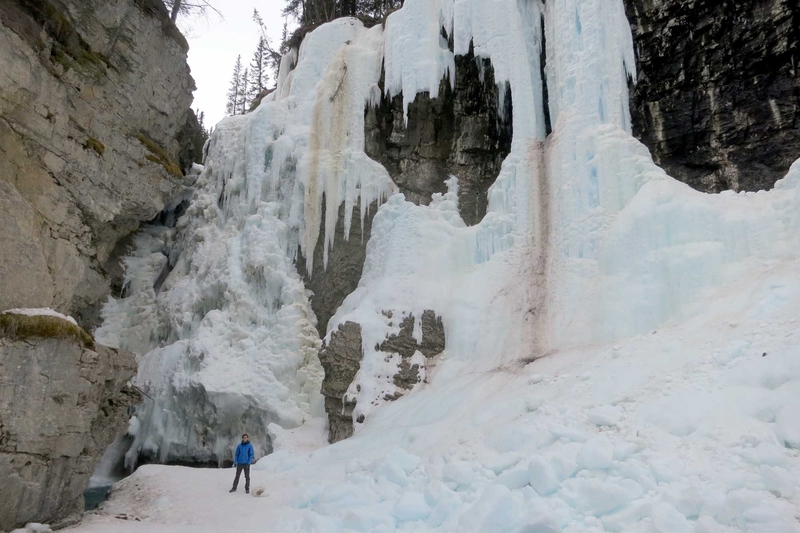 I think Johnson canyon was one of my favourite trails in the area, it's about a 30 minute drive from Banff and in winter is pretty spectacular (I would say it's also stunning in summer as well). It was like a winter wonderland, this was one of the walks that we definitely needed our cleats for! 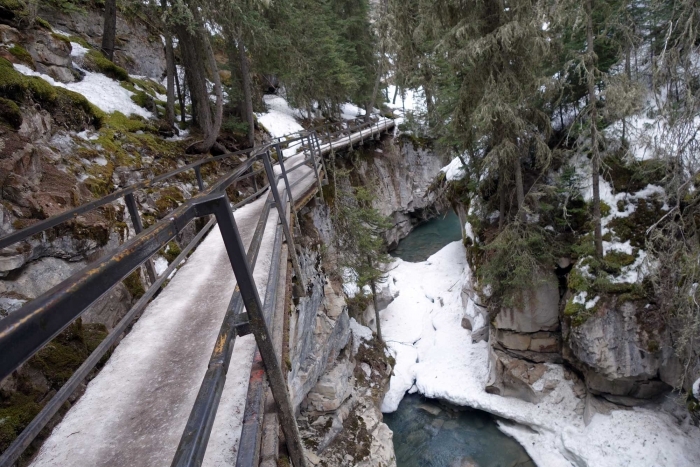 The path is a boardwalk and you can walk to the lower falls, then continue on to the upper falls or even further to the ink pots. The path to the lower falls is about 15 mins with no elevation. These were partially frozen and again, a novelty for us to see. We decided to continue on to the upper falls which was a further 15-20 minutes and required a little bit of uphill walking. 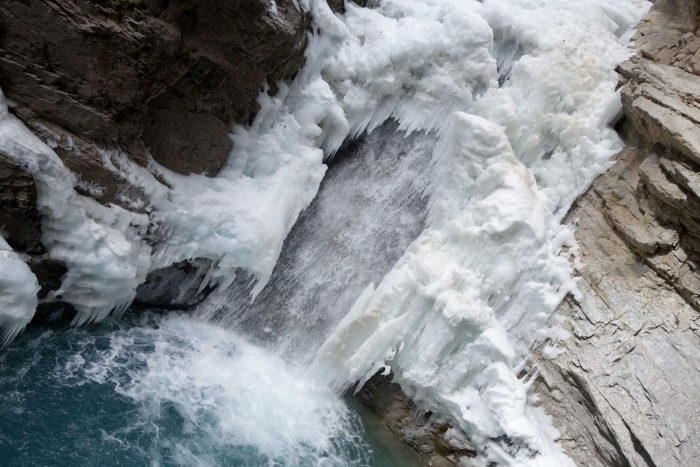 These falls were completely frozen and much much higher than the first set. Alistair went off path to try to get a better picture but I decided one of us should stay on solid ground, you know...just in case. This mountain was my own personal nemesis. I knew it was going to be bad as it was 5.6 km all uphill to the top but I wasn't prepared for my fear of heights to kick in on the way up! 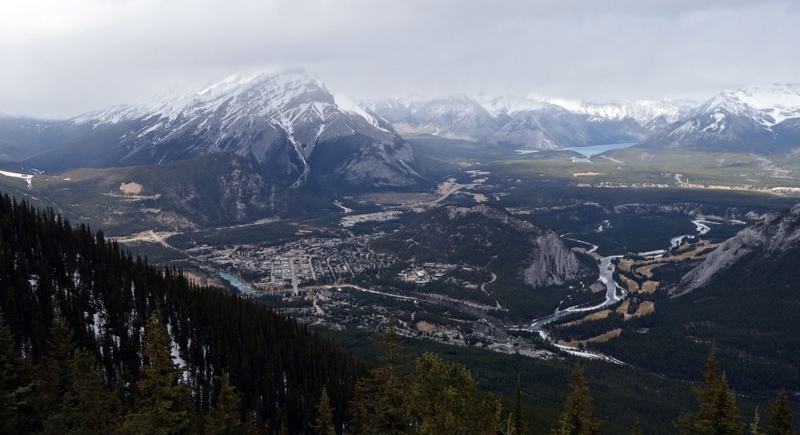 This is the mountain in Banff that the gondola goes up. 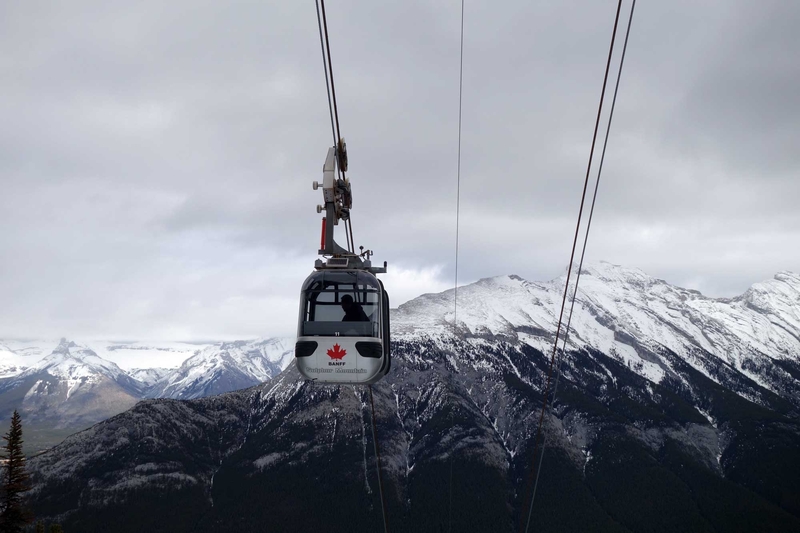 You can pay $40 each for the ride up or you can hike up the mountain and in winter, hikers get a free trip back down on the gondola which is of course what we chose to do. This was another track that required cleats all the way up. There are steep sections and it trail is a series of switchbacks up one side of the mountain until you reach the 630m elevation at the top. 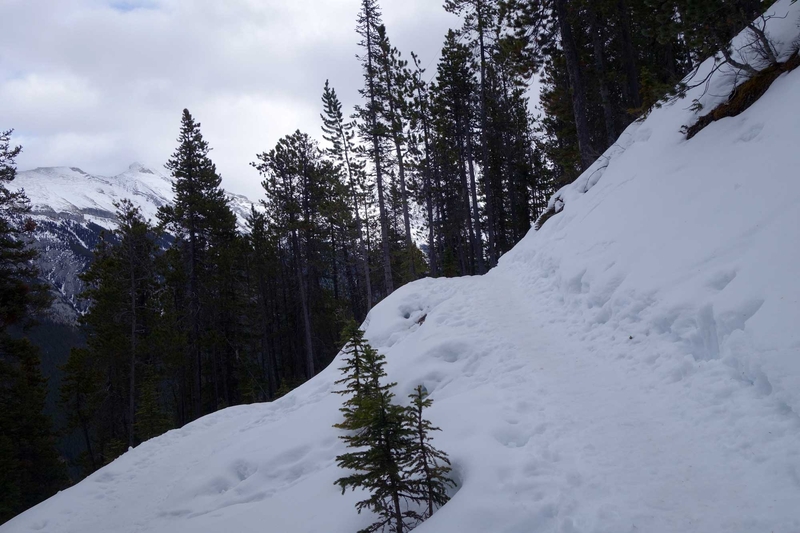 As we climbed, the path got narrower and more snowy. We were initially walking through trees but they became sparser and sparser and at some sections where the gondola goes up the side, there are no trees the whole way down so you are walking on a very small icy path on the edge of the mountain with a >500m drop below you....Alistair didn't quite seem to get where I was coming from and found my fear very amusing. Let's just say I was incredibly relieved to reach the top! At the top there is a further walk to the summit where an old cosmic ray station sits. This was heaven however because the whole thing was a boardwalk with railings and steps and no snow on the path! The views from the top are outstanding, you are surrounded by mountains and you can see for miles and miles. After checking out the summit, we decided it was time to get the gondola back down. Before going on the hike I think I would have been really scared of the gondola and going up to that height in one but after doing that walk, the gondola was an absolute breeze! We decided not to go to the hot springs at the base of the gondola because looking at pictures it didn't seem to top our experience of hot springs in New Zealand and so didn't seem worth it. Alistair says that this walk was his favourite and I will say that once I got to the top I felt an enormous sense of achievement and the views seemed earned in a way. I think it would be a much easier walk in summer but then you may have to pay a one way fee for the gondola back down. If you are really really scared of heights perhaps don't do the hike but the walk itself and the elevation are actually much more manageable than I imagined so don't let that put you off! 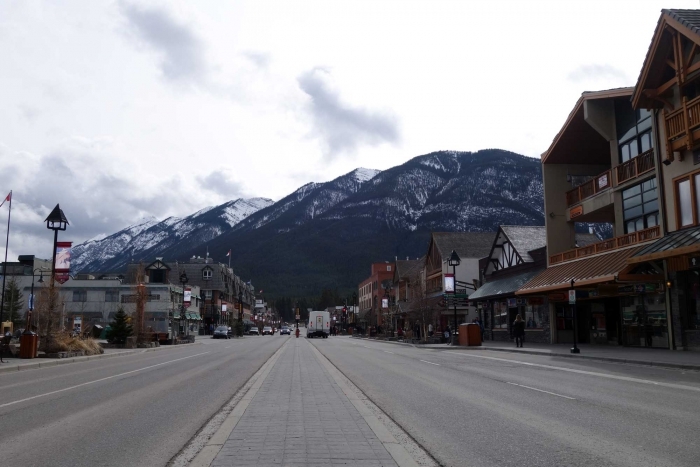 We also spent some time wandering around the town of Banff itself. We explored all of the shops when hunting for cleats and although there are a lot of shops aimed at tourists, the centre and Main Street are very pretty to walk around. 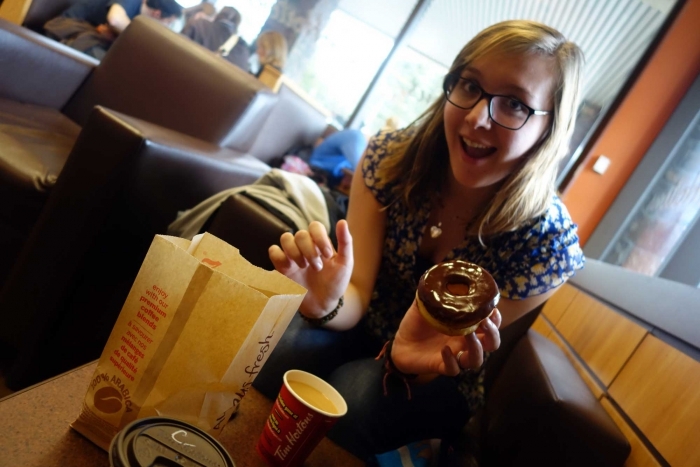 We also had our first experience of Tim Hortons donuts here. Those of you who know me, know I have somewhat of an affinity to donuts and is I was very eager to try Canada's famous version and I must say, they did not disappoint and I shall definitely be returning! We also tried some of 'the best ice cream in the world' apparently at Cows ice cream shop. This is one of the two branches on the best coast of Canada and very well reviewed. I thought it was very delicious but then again I love ice cream and would eat any sort that was given to me so perhaps I'm not the best judge. At another point we wandered out to the Fairmont springs hotel to see what all the fuss was about and I had also heard there was an ice rink and toboggan hill there. The hotel itself is in a fabulously old building that used to be a castle or something. Unfortunately my hopes of ice skating and tobogganing were dashed as the weather had been 'too good' apparently to keep them open :(. Our other activity in Banff was visiting the cinema. They too had a cheap Tuesday and so we made use of it to see Insurgent. I also managed to drag Alistair along to see Cinderella much to my delight:). The town is lovely at night and you feel quite safe wandering around, there is a great atmosphere. 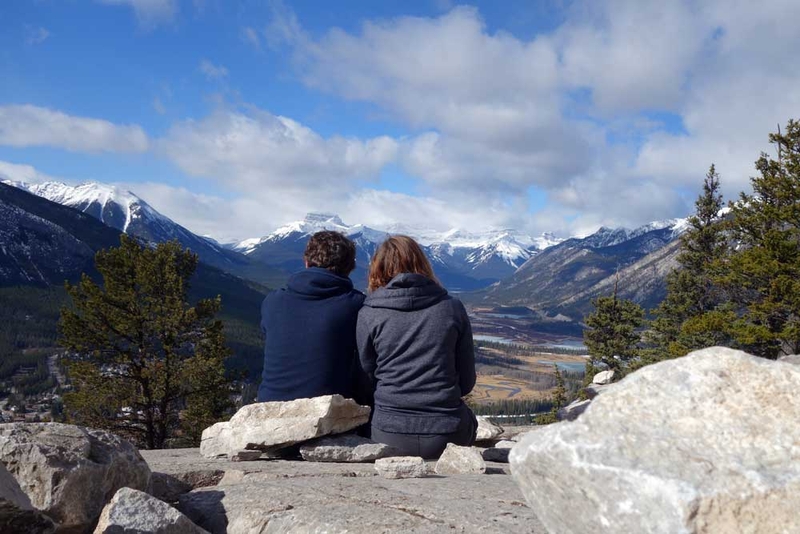 So there ends our time in Banff, we will be back briefly to return our car and get the overnight bus to Vancouver but for now it's time to say goodbye and head for Lake Louise!